Will the Guardian report on war crimes committed by Hamas? 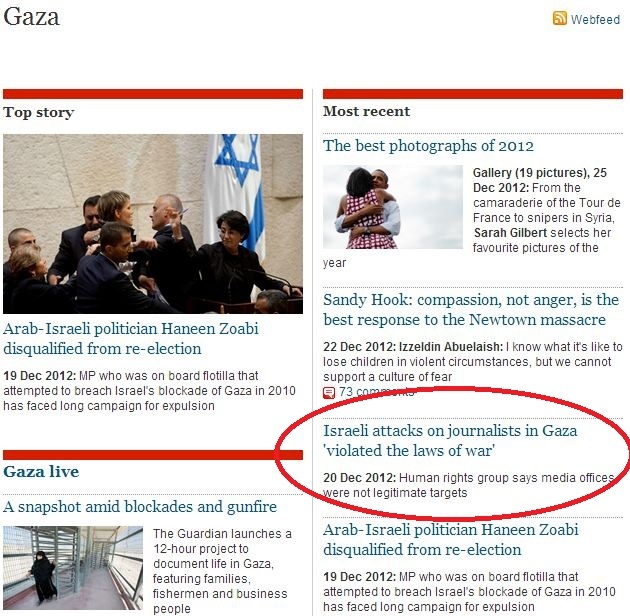 Here’s how the Guardian’s Gaza page looks today, Dec. 27. Currently missing from the page, however, is a report issued by HRW – reported elsewhere in the media – that Gaza terrorists violated the laws of war during the November conflict by launching over a thousand rockets toward population centers in Israel. HRW highlighted statements by the groups firing the weapons admitting that they were targeting civilians. No, it’s not significant that HRW occasionally takes a detour from it’s egregiously disproportionate criticism of Israel to acknowledge the painfully obvious about the contempt for human life routinely displayed by the Palestinian extremists who currently rule Gaza. The only question is whether the Guardian’s Israel correspondent will deem the Palestinians’ violation of Israeli human rights newsworthy. Will The Guardian and HRW report on this? Will Al-Guardian in the interests of balanced,free and fair reporting and journalism report on war crimes commited by hamas [and also in the interests of fair and balanced journalism point out the fact that much is not all of these war crimes are funded by iran] Errr is the pope a buddhist ???? The Guardian will not report on Hamas war crimes until it has figured out a way to blame Israel. I expect after having considered all the alternatives, they will be forced to fall back on their old standby, that Israel is to blame because it exists, and if only all the Jews in Israel would emigrate or commit suicide, Hamas would not be forced to commit war crimes. The Guardian reports on rocket and mortar attacks, on human shields, but he covers this crimes by giving them other names, by calling them legitimate resistance. In this sense The Guardian defends and promotes crimes against international law and humanity. btw, Zoabi won her appeal in a democratic country where the law is upheld. Will the Guardian report on that?